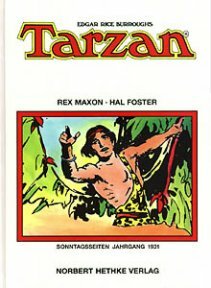 Reprints of Rex Maxon's Tarzan strips in the USA have been a rarity, through all the years he did his illustrations, and continuing down to the present day. While selected panels from Maxon's daily strips did appear in numerous Big Little Books during the 1930s and 40s, his Sunday pages were evidently never reproduced in any publication -- at least not in the USA. 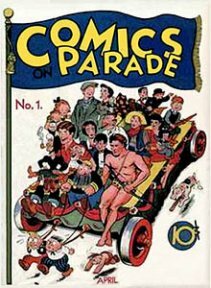 The studious reader might expect to find Maxon's 1931 Tarzan Sunday pages reproduced in the 1930s and 40s issues of United Features' Tip-Top Comics and Sparkler Comics, but, other than a single appearance on a Sparkler cover (#44), there is no Rex Maxon Tarzan artwork in either of these Sunday page reprint publications. The syndicate's Comics on Parade reprinted Tarzan daily strips with color added, from issue #1 to #29. The first few issues had Hal Foster artwork, but later numbers presented colorized Rex Maxon strips. This seems to have been Maxon's only presence in United Features reprint comics. In foreign comics editions the picture is a little rosier for Rex Maxon. 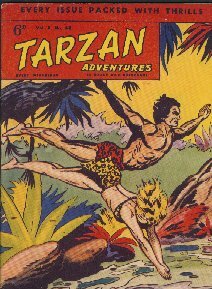 His Sunday Tarzan strips appeared in reduced size, with rather bland coloration, in issue #11 (Sept. 1976) of the Italian Tarzan Extra magazine. 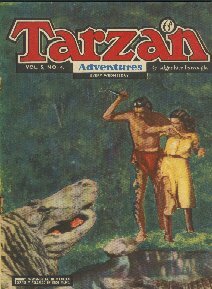 The same number featured a lengthy article on Maxon and his illustration of Tarzan. This was followed in 1990 by Norbert Hethke Verlag series of Sunday Tarzan strips, published in Germany. 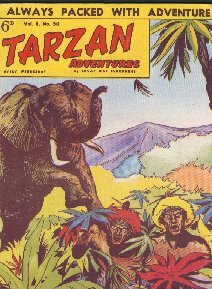 The first volume in that series reproduces the entire year of 1931 Tarzan pages, in much reduced format and with pastel watercolor hues replacing the original coloration. No doubt there were other Maxon reprints in various publications issued outside of the USA -- certainly there were such comics offered in England, and probably also in countries like France and Holland. 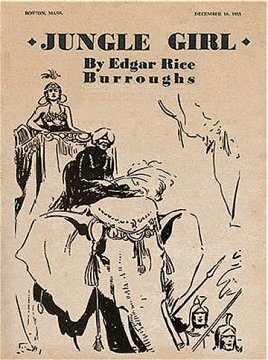 The reader can only wonder why this first artist of the Tarzan Sunday page has been excluded from ERB Inc.'s licensing of reprints for so many years. The situation was not much improved by the House of Greystoke's limited reproduction of some of Maxon's earliest daily strips -- much more could be compiled and put before the buying public. 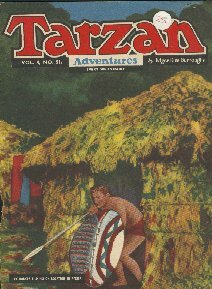 Editor Bill Blackbeard gives his reason for suppressing the Maxon Sunday strips, from the beautiful Tarzan in Color reprint books thusly: "I feel quite sure that the initial general response of the buying public, here and in Europe, to an opening volume full of Maxon would have been one of repulsion." Blackbeard, who feels that Maxon's Sunday strips are "gorgeously ludicrous," also says: "The mindles dithering of Maxon's attempt at plot need not be followed further in any detail; it was ended as soon as practicable by United Features." These words do not adequately represent the facts. 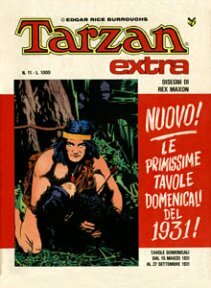 The German and Italian Maxon Sunday page editions were fit seemlessly into their respective series of Tarzan page reprints, without any apologies from the European editors. Also, it is unfair to think of Maxon having been responsible for every story detail in the initial 1931 Tarzan pages. 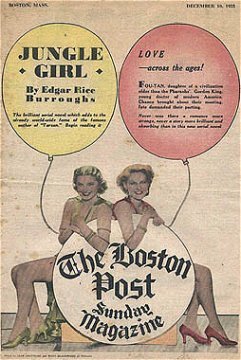 He worked from the script writer's text, as best he could, pioneering a serial art form that was previously represented by such lackluster strips as the Tailspin Tommy Sunday color pages. While the first 1931 Tarzan page story was indeed a silly one, Maxon illustrated it as well as any reader (other than perhaps ERB himself) might have expected to see, in an experimental venture into the uncharted "adventure" section of the "funny papers." A critical perusal of Maxon's daily strips, especially those from the 1940s, shows that he was capable of depicting Tarzan stories in an appealing and effective manner, acceptible to most fans of the "real Burroughs" creation. Given good scripts and clear instructions on how to picture the Apeman and his supporting cast of characters, there is no reason to think that Rex Maxon was too incompetent to illustrate the Tarzan Sunday page. But perhaps ERB's old dislike of Maxon's Tarzan panels still determines which artist's strips are kept in print today. If so, that's a sad thing. This inch-high graphic, with seven heads, was used by some newspapers and color printing companies to fill out blank space at the bottom of the Tarzan strip, when it was printed on over-sized sheets of newsprint. Rex Maxon created this filler strip during the first month of his work on the Tarzan Sunday page, but the useful piece appeared in some newspapers as late as the 1940s, at the bottom of Hogarth full pages and tabloid pages -- thus, Rex Maxon had the unintended honor of "outlasting" his next two replacements on the Tarzan page. The faces in the filler strip are a Waziri warrior, Numa the Lion, Master Bob Trevor, Tarzan, Miss Mary Trevor, Sheeta the leopard, and Zugo the ape, all of whom were featured in the first dozen Tarzan Sunday pages. The filler strip is seen here below the final panels from the third Hal Foster page, published on Sunday, October 11. 1931. This is the cover of the first dutch Tarzan comic. 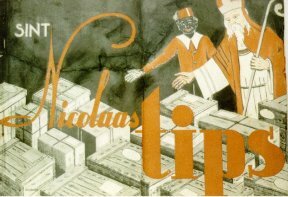 It is called Sint Nicolaas Tips. 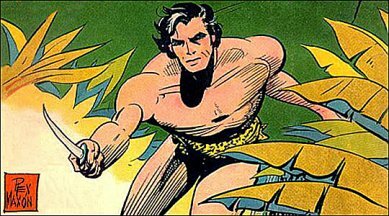 Tarzan's Return, art by Rex Maxon. It is dated 1937 by Delftsch Advertentieblad.